Already announced in December 2008, Moog Music will celebrate the return of the legendary Taurus Bass Pedals at Winter NAMM show 2010 in Anaheim, California. Long sought after as the ultimate bass synthesizer, used Taurus pedals from the seventies have been known to sell for as much as $5,000. The new edition of this classic instrument reproduces the Taurus I sound engine and combines it with modern features, reliability and an affordable price. Taurus Bass Pedals, long requested by Moog customers, have been used by Rush, Police, Genesis, Led Zeppelin, Phil Collins, Asia, Weezer, and many more. Specifications include a fully analogue sound engine based entirely on original TAURUS I circuits, one and half octaves on the floor, two VCO Oscillators, ADS Contour Generator, one VCF Filter, output VCA, 16 Banks with four programmable presets each. Bank 0 contains the Original Taurus I Presets VAR, TAURUS, TUBA, BASS. 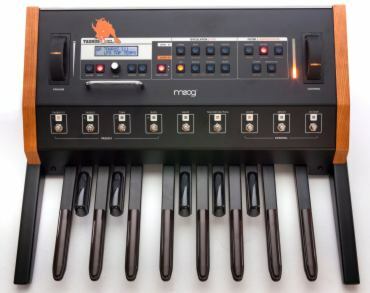 MIDI and USB are included as well as a MIDI-synchronisable arpeggiator with tap tempo. Control voltage inputs are for volume, filter, potch and gate. Only 1,000 of these new Taurus pedals will be built, so this might be a one time opportunity to own a new set with a new warranty but one absolutely faithful to the original Taurus I sound.